2.3 Already Running SmartSoft component instances? The term SmartSoft originally stands for the component based robotics framework that was published in 1999. Comparable with other robotic frameworks or middlewares, SmartSoft provides communication mechanisms to exchange information between components and provides a component container. However, there are clear and explicit communication semantics (communication patterns) and a clear component model. SmartSoft uses components with services as fundamental building blocks. In addition, SmartSoft provides implementations and tools such as the Eclipse based integrated model-driven SmartMDSD Toolchain. The SmartMDSD Toolchain supports the complete development process from component developer over system integration up to runtime aspects. One of the principles behind SmartSoft is that robotic systems have to be composed from components, rather than programmed. 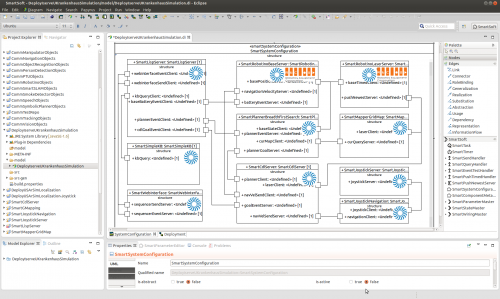 SmartSoft provides components in repositories ready for reuse and composition of new robotic applications through the SmartSoft MDSD toolchain. All other SmartSoft components can and are used in combination with those components as well, e.g. laser components, all the navigation, localization and mapping components, etc. .
We encourage all SmartSoft robotics software developer to use the SmartMDSD Toolchain, although it is possible to develop SmartSoft applications without it. With the SmartSoft toolchain you get support throughout the complete development process. Already Running SmartSoft component instances? Depending on the installed robotino debian packages smartsoft is already running on your robotino, providing the infrastructure and skills accessible through the robotino factroy app or robotino view. If you wan't to run your own smartsoft components or whole deployments on the robotino you should make sure that no other smartsoft components or an other SmartSoft namingservice is running. Hint: It is also possible to remove those components from robotino (later re-installation is easy). However some functionally of the robotino factroy app will not be available with uninstalled or stopped smartsoft components. SmartSoft and the SmartMDSD Toolchain enable the deployment of robotics applications form an development platform to the target robot, in this case a robotino. Therefore a typical development setup is to fetch and compile the sources on a development platform, to later deploy the binaries to the robotino. Important Hint: To make use of this development setup the development platform needs to run the same operation system version as the target platform, the robotino (due to dynamically linked dependencies). 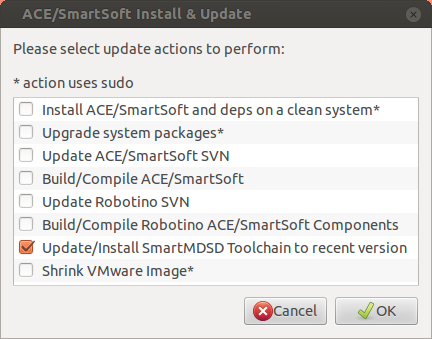 If for some reason this is not your preferred setup, its also equally possible to install SmartSoft and the SmartMDSD Toolchain onto the robotino itself. The later deployment target is in that case localhost, so that all functionality and support offered by the SmartMDSD Toolchain is available as well. Hint: To develop software on the robotino itself you can use the pre-installed VNC connection. 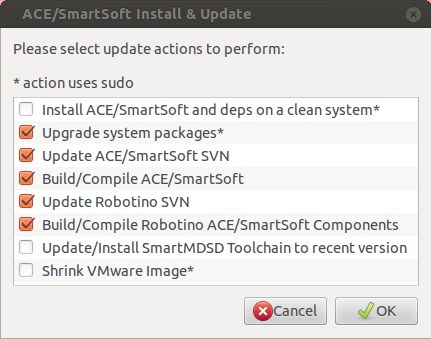 The script is also able to update and compile an existing SmartSoft installation. 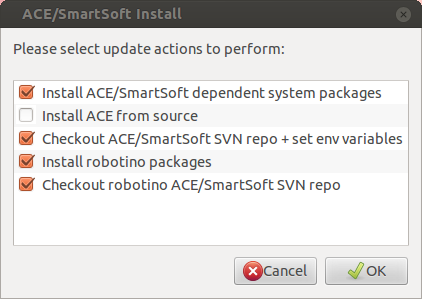 Hint: ACE should be installed as binary package from the robotino debian repo! The script will update the system and install the necessary system packages to compile all SmartSoft-Components. SmartSoft will be located in ~/SOFTWARE/smartsoft as a subversion checkout pointing to HEAD of TRUNK of the SourceForge SmartSoft main repository. The necessary environment variables are set in ~/.profile . The robotino repository checkout will be locate in ~/SOFTWARE/smartsoft_robotino_components . Important Hint: To apply changed and added environment variables set in the ~/.profile restart the system! 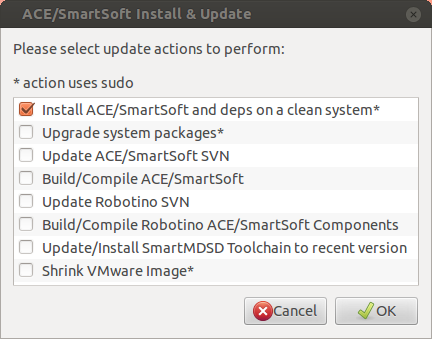 The script (now also available in $SMART_ROOT_ACE) can also be used to compile (and update) a SmartSoft installation and system. The script updates the system packages, the subversion checkouts and finally compiles the SmartSoft installation. Important Hint: Find more tutorials how to use the SmartMDSD Toolchain at the Video Tutorials page. Video tutorials how to use the SmartMDSD Toolchain are available at the Video Tutorials page of http://servicerobotik-ulm.de/. This page was last edited on 3 April 2018, at 12:01.